Citation Information: J Clin Invest. 2006;116(6):1459-1459. https://doi.org/10.1172/JCI120034. Citation Information: J Clin Invest. 2006;116(6):1460-1461. https://doi.org/10.1172/JCI28893. The feedback received regarding my recent editorial “Rescuing the NIH before it is too late” has been fascinating to read. The opinions expressed illustrate a huge divide between those in charge of the NIH and those who rely on extramural funding to support their research. Citation Information: J Clin Invest. 2006;116(6):1462-1464. https://doi.org/10.1172/JCI28894. We, the directors of the 27 NIH institutes and centers, wanted to respond to the points made by Andrew Marks in his recent editorial. While we appreciate that the scientific community has concerns, the current initiatives and directions of the NIH have been developed through planning processes that reflect openness and continued constituency input, all aimed at assessing scientific opportunities and addressing public health needs. Citation Information: J Clin Invest. 2006;116(6):1463-1463. https://doi.org/10.1172/JCI28895. Andrew Marks’ recent editorial eloquently reiterated a concern that many of us have voiced before, that the current policies and practices of the NIH are not serving the public well. Citation Information: J Clin Invest. 2006;116(6):1463-1464. https://doi.org/10.1172/JCI28955. For a number of reasons, the NIH and the biomedical research community are facing a period of fiscal constraint after pronounced growth. In these difficult times, it is important that we all speak from the facts and work together to do a better job of explaining the importance of the nation’s investment in biomedical research. Citation Information: J Clin Invest. 2006;116(6):1465-1465. https://doi.org/10.1172/JCI28952. Citation Information: J Clin Invest. 2006;116(6):1466-1466. https://doi.org/10.1172/JCI28964. Citation Information: J Clin Invest. 2006;116(6):1467-1470. https://doi.org/10.1172/JCI28884. The question of what differentiates physiological from pathological cardiac hypertrophy remains one of the most clinically relevant questions in basic cardiovascular research. The answer(s) to this question will have far-ranging importance in the fight against hypertrophic heart disease and failure. In this issue of the JCI, Perrino et al. have used a unique model system to mimic the pathophysiologic effects of an intermittent pressure overload on the heart — in effect, to examine the basic issue of what determines an in vivo pathogenic stimulus (see the related article beginning on page 1547). Their findings clearly show that it is the nature of the inciting stimulus, as opposed to chronicity, that establishes the initial pathogenic response and that a distinct disruption of the β-adrenergic system is centrally involved in the earliest alterations of myocellular physiology. These results suggest both a new paradigm for treatment options in hypertrophic cardiac disease and novel methodologies for further studies. Citation Information: J Clin Invest. 2006;116(6):1470-1473. https://doi.org/10.1172/JCI28735. A reduced sympathoadrenal response, induced by recent antecedent hypoglycemia, is the key feature of hypoglycemia-associated autonomic failure (HAAF) and, thus, the pathogenesis of iatrogenic hypoglycemia in diabetes. Understanding of the mechanism(s) of that reduced response awaits new insight into its basic molecular, cellular, organ, and whole-body physiology and pathophysiology in experimental models. 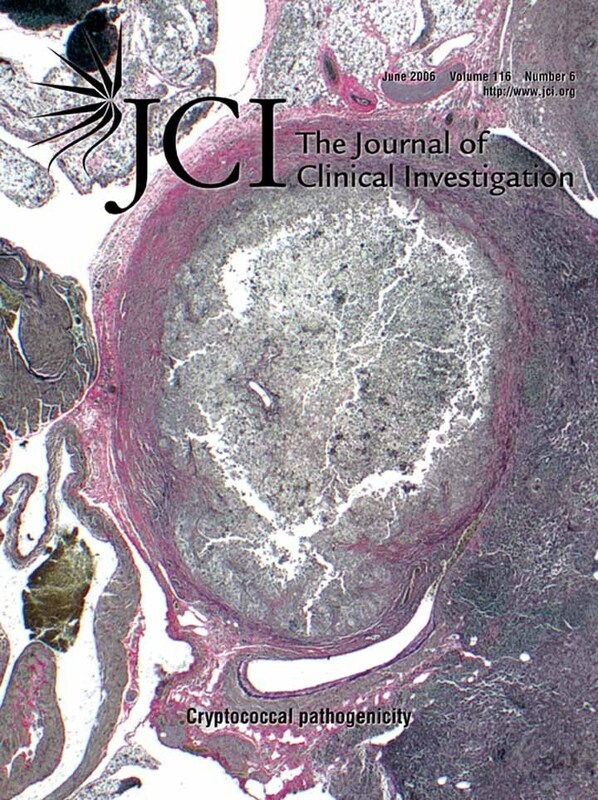 In this issue of the JCI, McCrimmon and colleagues report that application of urocortin I (a corticotrophin-releasing factor receptor–2 agonist) to the ventromedial hypothalamus reduces the glucose counterregulatory response to hypoglycemia in rats (see the related article beginning on page 1723). Thus, hypothalamic urocortin I release during antecedent hypoglycemia is, among other possibilities, a potential mechanism of HAAF. Citation Information: J Clin Invest. 2006;116(6):1473-1475. https://doi.org/10.1172/JCI28880. Genetic defects in the transcription factor forkhead box protein P3 (Foxp3) cause immune dysregulation, polyendocrinopathy, enteropathy, X-linked (IPEX). IPEX is thought to be due to a defect in naturally arising CD4+ Tregs. In this issue of the JCI, Bacchetta and colleagues demonstrate that patients with IPEX and missense mutations in Foxp3 provide insight into the role of various domains of Foxp3 in the development and function of Tregs (see the related article beginning on page 1713). Citation Information: J Clin Invest. 2006;116(6):1475-1478. https://doi.org/10.1172/JCI28734. Mycolic acids and structures attached to them constitute a major part of the protective envelope of Mycobacterium tuberculosis, and for this reason, their role in tuberculosis pathogenesis has been extensively studied. In this issue of the JCI, Rao et al. examine the effect of trans-cyclopropanation of oxygenated mycolic acids attached to trehalose dimycolate (TDM) on the murine immune response to infection (see the related article beginning on page 1660). Surprisingly, they found that an M. tuberculosis mutant lacking trans-cyclopropane rings was hypervirulent in mice. The recent recognition of a hypervirulence phenotype in mice associated with laboratory and clinical M. tuberculosis strains with altered cell wall components has provided new insights into how M. tuberculosis may establish persistent infection. However, to date, characterization of these bioactive products in pathogenesis has been largely reductionistic; the relationship of their effects observed in mice to the persistent infection and tuberculosis caused by M. tuberculosis observed in humans remains obscure. Citation Information: J Clin Invest. 2006;116(6):1478-1481. https://doi.org/10.1172/JCI28774. Previous studies using stearoyl-CoA desaturase–1–deficient (SCD1-deficient) mice have shown that this enzyme plays an important role in many diseases of altered cellular metabolism including obesity, insulin resistance, and dyslipidemia. Although SCD1 activity is highest in lipogenic tissues such as the liver and adipose tissue, it is also present at lower levels in most tissues. To better understand the role of SCD1 in liver metabolism it is necessary to explore SCD1 deficiency in a more focused, tissue-specific manner. This commentary focuses on 2 recent studies published in the JCI that address this question using antisense oligonucleotide inhibition of SCD1. First, Jiang et al. have previously reported that long-term inhibition of SCD1 prevents the development of high-fat diet–induced obesity and hepatic steatosis. Second, Gutiérrez-Juárez et al. show in this issue that short-term inhibition of hepatic SCD1 is sufficient to prevent diet-induced hepatic insulin resistance, signifying an important role of hepatic SCD1 in liver insulin sensitivity (see related article beginning on page 1686). Citation Information: J Clin Invest. 2006;116(6):1481-1483. https://doi.org/10.1172/JCI28842. In this issue of the JCI, the observation of the altered pathogenicity of a Cryptococcus neoformans glucosylceramide (GlcCer) mutant shines new light on the initiation of cryptococcal infection. Rittershaus and colleagues demonstrate that the cell surface glycosphingolipid GlcCer is essential for the fungus to grow in the extracellular environments of the host bloodstream and alveolar spaces of the lung, which, in contrast to the acidic intracellular environment of macrophages, are characterized by a neutral pH (see the related article beginning on page 1651). Their findings establish an unexpected connection between this glycosphingolipid and the fungal responses to physiological CO2 and pH. They also focus new attention on the therapeutic potential of anti-GlcCer antibodies found in convalescent sera. Citation Information: J Clin Invest. 2006;116(6):1484-1493. https://doi.org/10.1172/JCI27704. Ectopic pancreas is a developmental anomaly occasionally found in humans. Hes1, a main effector of Notch signaling, regulates the fate and differentiation of many cell types during development. To gain insights into the role of the Notch pathway in pancreatic fate determination, we combined the use of Hes1-knockout mice and lineage tracing employing the Cre/loxP system to specifically mark pancreatic precursor cells and their progeny in Ptf1a-cre and Rosa26 reporter mice. We show that inactivation of Hes1 induces misexpression of Ptf1a in discrete regions of the primitive stomach and duodenum and throughout the common bile duct. All ectopic Ptf1a-expressing cells were reprogrammed, or transcommitted, to multipotent pancreatic progenitor status and subsequently differentiated into mature pancreatic exocrine, endocrine, and duct cells. This process recapitulated normal pancreatogenesis in terms of morphological and genetic features. Furthermore, analysis of Hes1/Ptf1a double mutants revealed that ectopic Ptf1a-cre lineage–labeled cells adopted the fate of region-appropriate gut epithelium or endocrine cells similarly to Ptf1a-inactivated cells in the native pancreatic buds. Our data demonstrate that the Hes1-mediated Notch pathway is required for region-appropriate specification of pancreas in the developing foregut endoderm through regulation of Ptf1a expression, providing novel insight into the pathogenesis of ectopic pancreas development in a mouse model. Citation Information: J Clin Invest. 2006;116(6):1494-1505. https://doi.org/10.1172/JCI26498. Adipocytes secrete a variety of bioactive molecules that affect the insulin sensitivity of other tissues. We now show that the abundance of monocyte chemoattractant protein–1 (MCP-1) mRNA in adipose tissue and the plasma concentration of MCP-1 were increased both in genetically obese diabetic (db/db) mice and in WT mice with obesity induced by a high-fat diet. Mice engineered to express an MCP-1 transgene in adipose tissue under the control of the aP2 gene promoter exhibited insulin resistance, macrophage infiltration into adipose tissue, and increased hepatic triglyceride content. Furthermore, insulin resistance, hepatic steatosis, and macrophage accumulation in adipose tissue induced by a high-fat diet were reduced extensively in MCP-1 homozygous KO mice compared with WT animals. Finally, acute expression of a dominant-negative mutant of MCP-1 ameliorated insulin resistance in db/db mice and in WT mice fed a high-fat diet. These findings suggest that an increase in MCP-1 expression in adipose tissue contributes to the macrophage infiltration into this tissue, insulin resistance, and hepatic steatosis associated with obesity in mice. Citation Information: J Clin Invest. 2006;116(6):1506-1513. https://doi.org/10.1172/JCI27645. Diabetes results from an absolute or relative reduction in pancreatic β cell mass (BCM) leading to insufficient insulin secretion and hyperglycemia. Measurement of insulin secretory capacity is currently used as a surrogate measure of BCM. However, serum insulin concentrations provide an imprecise index of BCM, and no reliable noninvasive measure of BCM is currently available. Type 2 vesicular monoamine transporters (VMAT2) are expressed in human islet β cells, as well as in tissues of the CNS. [11C]Dihydrotetrabenazine ([11C]DTBZ) binds specifically to VMAT2 and is a radioligand currently used in clinical imaging of the brain. Here we report the use of [11C]DTBZ to estimate BCM in a rodent model of spontaneous type 1 diabetes (the BB-DP rat). In longitudinal PET studies of the BB-DP rat, we found a significant decline in pancreatic uptake of [11C]DTBZ that anticipated the loss of glycemic control. Based on comparison of standardized uptake values (SUVs) of [11C]DTBZ and blood glucose concentrations, loss of more than 65% of the original SUV correlated significantly with the development of persistent hyperglycemia. These studies suggest that PET-based quantitation of VMAT2 receptors provides a noninvasive measurement of BCM that could be used to study the pathogenesis of diabetes and to monitor therapeutic interventions. Citation Information: J Clin Invest. 2006;116(6):1514-1524. https://doi.org/10.1172/JCI27564. HIV infection selectively targets CD4+ effector memory T (TEM) cells, resulting in dramatic depletion of CD4+ T cells in mucosal effector sites in early infection. Regeneration of the TEM cell compartment is slow and incomplete, even when viral replication is controlled by antiretroviral therapy (ART). Here, we demonstrate that IL-15 dramatically increases in vivo proliferation of rhesus macaque (RM) CD4+ and CD8+ TEM cells with little effect on the naive or central memory T (TCM) cell subsets, a response pattern that is quite distinct from that of either IL-2 or IL-7. TEM cells produced in response to IL-15 did not accumulate in blood. Rather, 5-bromo-2′-deoxyuridine (BrdU) labeling studies suggest that many of these cells rapidly disperse to extralymphoid effector sites, where they manifest (slow) decay kinetics indistinguishable from that of untreated controls. In RMs with uncontrolled SIV infection and highly activated immune systems, IL-15 did not significantly increase CD4+ TEM cell proliferation, but with virologic control and concomitant reduction in immune activation by ART, IL-15 responsiveness was again observed. These data suggest that therapeutic use of IL-15 in the setting of ART might facilitate specific restoration of the CD4+ T cell compartment that is the primary target of HIV with less risk of exhausting precursor T cell compartments or generating potentially deleterious regulatory subsets. Citation Information: J Clin Invest. 2006;116(6):1535-1546. https://doi.org/10.1172/JCI25442. Dynamic and reciprocal epithelial-mesenchymal interactions are critical for the normal morphogenesis and maintenance of epithelia. Epimorphin has been identified as a unique molecule expressed by mesenchymal cells and myofibroblasts and has putative morphogenetic effects in multiple epithelial tissues, including intestine, skin, mammary gland, lung, gallbladder, and liver. To define the in vivo role of epimorphin, we created epimorphin-null mice by targeted inactivation of the epimorphin gene. Male epimorphin–/– mice are sterile due to abnormal testicular development and impaired spermatogenesis. Intestinal growth is increased in epimorphin–/– mice due to augmented crypt cell proliferation and crypt fission during the neonatal (suckling) period, mediated at least in part by changes in bone morphogenetic protein (Bmp) and Wnt/β-catenin signaling pathways. Colonic mucosal injury and colitis induced by dextran sodium sulfate (DSS) are ameliorated in epimorphin–/– mice, probably due to the increased proliferative capacity of the epimorphin–/– colon. These in vivo findings support the notion that epimorphin is a key stromal regulator of epithelial cell proliferation and growth in the intestine. In addition, our studies demonstrate a novel and critical role for epimorphin in regulating testicular development and growth as well as spermatogenesis. Citation Information: J Clin Invest. 2006;116(6):1547-1560. https://doi.org/10.1172/JCI25397. For over a century, there has been intense debate as to the reason why some cardiac stresses are pathological and others are physiological. One long-standing theory is that physiological overloads such as exercise are intermittent, while pathological overloads such as hypertension are chronic. In this study, we hypothesized that the nature of the stress on the heart, rather than its duration, is the key determinant of the maladaptive phenotype. To test this, we applied intermittent pressure overload on the hearts of mice and tested the roles of duration and nature of the stress on the development of cardiac failure. Despite a mild hypertrophic response, preserved systolic function, and a favorable fetal gene expression profile, hearts exposed to intermittent pressure overload displayed pathological features. Importantly, intermittent pressure overload caused diastolic dysfunction, altered β-adrenergic receptor (βAR) function, and vascular rarefaction before the development of cardiac hypertrophy, which were largely normalized by preventing the recruitment of PI3K by βAR kinase 1 to ligand-activated receptors. Thus stress-induced activation of pathogenic signaling pathways, not the duration of stress or the hypertrophic growth per se, is the molecular trigger of cardiac dysfunction. Citation Information: J Clin Invest. 2006;116(6):1561-1570. https://doi.org/10.1172/JCI24652. Metastasis is the major cause of cancer morbidity, but strategies for direct interference with invasion processes are lacking. Dedifferentiated, late-stage tumor cells secrete multiple factors that represent attractive targets for therapeutic intervention. Here we show that metastatic potential of oncogenic mammary epithelial cells requires an autocrine PDGF/PDGFR loop, which is established as a consequence of TGF-β–induced epithelial-mesenchymal transition (EMT), a faithful in vitro correlate of metastasis. The cooperation of autocrine PDGFR signaling with oncogenic Ras hyperactivates PI3K and is required for survival during EMT. Autocrine PDGFR signaling also contributes to maintenance of EMT, possibly through activation of STAT1 and other distinct pathways. Inhibition of PDGFR signaling interfered with EMT and caused apoptosis in murine and human mammary carcinoma cell lines. Consequently, overexpression of a dominant-negative PDGFR or application of the established cancer drug STI571 interfered with experimental metastasis in mice. Similarly, in mouse mammary tumor virus–Neu (MMTV-Neu) transgenic mice, TGF-β enhanced metastasis of mammary tumors, induced EMT, and elevated PDGFR signaling. Finally, expression of PDGFRα and -β correlated with invasive behavior in human mammary carcinomas. Thus, autocrine PDGFR signaling plays an essential role during cancer progression, suggesting a novel application of STI571 to therapeutically interfere with metastasis. Citation Information: J Clin Invest. 2006;116(6):1571-1581. https://doi.org/10.1172/JCI25660. RA is an autoimmune disease characterized by sustained imbalance between pro- and antiinflammatory immune mechanisms. The SOCS proteins are negative regulators of cytokine signaling, but to date there has been little information on their function in disease. The generation of Socs3–/Δvav mice, which lack SOCS-3 in the hematopoietic and endothelial cell compartment, allowed us to explore the role of endogenous SOCS-3 during acute inflammatory arthritis. Joint inflammation in Socs3–/Δvav mice was particularly severe and was characterized by increased numbers of neutrophils in the inflamed synovium, bone marrow, peripheral blood, and spleen. These features were most likely due to increased production of and enhanced responsiveness to G-CSF and IL-6 during arthritis in these mice. Local osteoclast generation and bone destruction were also dramatically increased in the absence of SOCS-3, as was macrophage activation. Finally, SOCS-3 was found to negatively regulate CD4+ T lymphocyte activation, including production of the pleiotropic cytokine IL-17. The absence of SOCS-3 therefore had dramatic effects in this disease model, with a broader impact on cellular responses than SOCS-1 deficiency. These findings provide direct in vivo evidence that endogenous SOCS-3 is a critical negative regulator of multiple cell types orchestrating inflammatory joint disease. Citation Information: J Clin Invest. 2006;116(6):1582-1595. https://doi.org/10.1172/JCI27236. Identification of specific gene expression signatures characteristic of oncogenic pathways is an important step toward molecular classification of human malignancies. Aberrant activation of the Met signaling pathway is frequently associated with tumor progression and metastasis. In this study, we defined the Met-dependent gene expression signature using global gene expression profiling of WT and Met-deficient primary mouse hepatocytes. Newly identified transcriptional targets of the Met pathway included genes involved in the regulation of oxidative stress responses as well as cell motility, cytoskeletal organization, and angiogenesis. To assess the importance of a Met-regulated gene expression signature, a comparative functional genomic approach was applied to 242 human hepatocellular carcinomas (HCCs) and 7 metastatic liver lesions. Cluster analysis revealed that a subset of human HCCs and all liver metastases shared the Met-induced expression signature. Furthermore, the presence of the Met signature showed significant correlation with increased vascular invasion rate and microvessel density as well as with decreased mean survival time of HCC patients. We conclude that the genetically defined gene expression signatures in combination with comparative functional genomics constitute an attractive paradigm for defining both the function of oncogenic pathways and the clinically relevant subgroups of human cancers. Citation Information: J Clin Invest. 2006;116(6):1596-1605. https://doi.org/10.1172/JCI24340. Carcinoembryonic antigen–related cell adhesion molecule 1 (CEACAM1), a cellular adhesion molecule of the Ig superfamily, is associated with early stages of angiogenesis. In vitro, CEACAM1 regulates proliferation, migration, and differentiation of murine endothelial cells. To prove that CEACAM1 is functionally involved in the regulation of vascular remodeling in vivo, we analyzed 2 different genetic models: in Ceacam1–/– mice, the Ceacam1 gene was deleted systemically, and in CEACAM1endo+ mice, CEACAM1 was overexpressed under the control of the endothelial cell–specific promoter of the Tie2 receptor tyrosine kinase. In Matrigel plug assays, Ceacam1–/– mice failed to establish new capillaries whereas in CEACAM1endo+ mice the implants were vascularized extensively. After induction of hind limb ischemia by femoral artery ligation, Ceacam1–/– mice showed significantly reduced growth of arterioles and collateral blood flow compared with their WT littermates. In agreement with a causal role of CEACAM1 in vascular remodeling, CEACAM1endo+ mice exhibited an increase in revascularization and collateral blood flow after arterial occlusion. Our findings indicate that CEACAM1 expression is important for the establishment of newly formed vessels in vivo. Hence CEACAM1 could be a future target for therapeutic manipulation of angiogenesis in disease. Citation Information: J Clin Invest. 2006;116(6):1606-1614. https://doi.org/10.1172/JCI27183. Activation of latent TGF-β by the αvβ6 integrin is a critical step in the development of acute lung injury. However, the mechanism by which αvβ6-mediated TGF-β activation is regulated has not been identified. We show that thrombin, and other agonists of protease-activated receptor 1 (PAR1), activate TGF-β in an αvβ6 integrin–specific manner. This effect is PAR1 specific and is mediated by RhoA and Rho kinase. Intratracheal instillation of the PAR1-specific peptide TFLLRN increases lung edema during high-tidal-volume ventilation, and this effect is completely inhibited by a blocking antibody against the αvβ6 integrin. Instillation of TFLLRN during high-tidal-volume ventilation is associated with increased pulmonary TGF-β activation; however, this is not observed in Itgb6–/– mice. Furthermore, Itgb6–/– mice are also protected from ventilator-induced lung edema. We also demonstrate that pulmonary edema and TGF-β activity are similarly reduced in Par1–/– mice following bleomycin-induced lung injury. These results suggest that PAR1-mediated enhancement of αvβ6-dependent TGF-β activation could be one mechanism by which activation of the coagulation cascade contributes to the development of acute lung injury, and they identify PAR1 and the αvβ6 integrin as potential therapeutic targets in this condition. Citation Information: J Clin Invest. 2006;116(6):1615-1623. https://doi.org/10.1172/JCI27238. Transfusion-related acute lung injury (TRALI) is the most common cause of transfusion-related mortality. To explore the pathogenesis of TRALI, we developed an in vivo mouse model based on the passive transfusion of an MHC class I (MHC I) mAb (H2Kd) to mice with the cognate antigen. Transfusion of the MHC I mAb to BALB/c mice produced acute lung injury with increased excess lung water, increased lung vascular and lung epithelial permeability to protein, and decreased alveolar fluid clearance. There was 50% mortality at a 2-hour time point after Ab administration. Pulmonary histology and immunohistochemistry revealed prominent neutrophil sequestration in the lung microvasculature that occurred concomitantly with acute peripheral blood neutropenia, all within 2 hours of administration of the mAb. Depletion of neutrophils by injection of anti-granulocyte mAb Gr-1 protected mice from lung injury following MHC I mAb challenge. FcRγ–/– mice were resistant to MHC I mAb–induced lung injury, while adoptive transfer of wild-type neutrophils into the FcRγ–/– animals restored lung injury following MHC I mAb challenge. In conclusion, in a clinically relevant in vivo mouse model of TRALI using an MHC I mAb, the mechanism of lung injury was dependent on neutrophils and their Fcγ receptors. Citation Information: J Clin Invest. 2006;116(6):1624-1632. https://doi.org/10.1172/JCI26150. Histamine, signaling via the type 1 receptor (H1R), has been shown to suppress Th2 cytokine production by in vitro cultured T cells. We examined the role of H1R in allergic inflammation in vivo using a murine asthma model. Allergen-stimulated splenic T cells from sensitized H1R–/– mice exhibited enhanced Th2 cytokine production. Despite this Th2 bias, allergen-challenged H1R–/– mice exhibited diminished lung Th2 cytokine mRNA levels, airway inflammation, goblet cell metaplasia, and airway hyperresponsiveness (AHR). Restoration of pulmonary Th2 cytokines in H1R–/– mice by intranasal IL-4 or IL-13 restored inflammatory lung responses and AHR. Further investigation revealed that histamine acts as a T cell chemotactic factor and defective T cell trafficking was responsible for the absence of lung inflammation. Cultured T cells migrated in response to histamine in vitro, but this was ablated by blockade of H1R but not H2R. In vivo, allergen-specific WT but not H1R–/– CD4+ T cells were recruited to the lungs of naive recipients following inhaled allergen challenge. H1R–/– T cells failed to confer airway inflammation or AHR observed after transfer of WT T cells. Our data establish a role for histamine and H1R in promoting the migration of Th2 cells into sites of allergen exposure. Citation Information: J Clin Invest. 2006;116(6):1633-1641. https://doi.org/10.1172/JCI25702. Bronchial asthma, the most prevalent cause of significant respiratory morbidity in the developed world, typically is a chronic disorder associated with long-term changes in the airways. We developed a mouse model of chronic asthma that results in markedly increased numbers of airway mast cells, enhanced airway responses to methacholine or antigen, chronic inflammation including infiltration with eosinophils and lymphocytes, airway epithelial goblet cell hyperplasia, enhanced expression of the mucin genes Muc5ac and Muc5b, and increased levels of lung collagen. Using mast cell–deficient (KitW-sh/W-sh and/or KitW/W-v) mice engrafted with FcRγ+/+ or FcRγ–/– mast cells, we found that mast cells were required for the full development of each of these features of the model. However, some features also were expressed, although usually at less than wild-type levels, in mice whose mast cells lacked FcRγ and therefore could not be activated by either antigen- and IgE-dependent aggregation of FcεRI or the binding of antigen-IgG1 immune complexes to FcγRIII. These findings demonstrate that mast cells can contribute to the development of multiple features of chronic asthma in mice and identify both FcRγ-dependent and FcRγ-independent pathways of mast cell activation as important for the expression of key features of this asthma model. Citation Information: J Clin Invest. 2006;116(6):1642-1650. https://doi.org/10.1172/JCI27114. The fungal pathogen Candida albicans has a multilayered cell wall composed of an outer layer of proteins glycosylated with N- or O-linked mannosyl residues and an inner skeletal layer of β-glucans and chitin. We demonstrate that cytokine production by human mononuclear cells or murine macrophages was markedly reduced when stimulated by C. albicans mutants defective in mannosylation. Recognition of mannosyl residues was mediated by mannose receptor binding to N-linked mannosyl residues and by TLR4 binding to O-linked mannosyl residues. Residual cytokine production was mediated by recognition of β-glucan by the dectin-1/TLR2 receptor complex. C. albicans mutants with a cell wall defective in mannosyl residues were less virulent in experimental disseminated candidiasis and elicited reduced cytokine production in vivo. We concluded that recognition of C. albicans by monocytes/macrophages is mediated by 3 recognition systems of differing importance, each of which senses specific layers of the C. albicans cell wall. Citation Information: J Clin Invest. 2006;116(6):1651-1659. https://doi.org/10.1172/JCI27890. The pathogenic fungus Cryptococcus neoformans infects humans upon inhalation and causes the most common fungal meningoencephalitis in immunocompromised subjects worldwide. In the host, C. neoformans is found both intracellularly and extracellularly, but how these two components contribute to the development of the disease is largely unknown. Here we show that the glycosphingolipid glucosylceramide (GlcCer), which is present in C. neoformans, was essential for fungal growth in host extracellular environments, such as in alveolar spaces and in the bloodstream, which are characterized by a neutral/alkaline pH, but not in the host intracellular environment, such as in the phagolysosome of macrophages, which is characteristically acidic. Indeed, a C. neoformans mutant strain lacking GlcCer did not grow in vitro at a neutral/alkaline pH, yet it had no growth defect at an acidic pH. The mechanism by which GlcCer regulates alkali tolerance was by allowing the transition of C. neoformans through the cell cycle. This study establishes C. neoformans GlcCer as a key virulence factor of cryptococcal pathogenicity, with important implications for future development of new antifungal strategies. Citation Information: J Clin Invest. 2006;116(6):1660-1667. https://doi.org/10.1172/JCI27335. Recent studies have shown that fine structural modifications of Mycobacterium tuberculosis cell envelope lipids mediate host cell immune activation during infection. One such alteration in lipid structure is cis-cyclopropane modification of the mycolic acids on trehalose dimycolate (TDM) mediated by proximal cyclopropane synthase of α mycolates (pcaA), a proinflammatory lipid modification during early infection. Here we examine the pathogenetic role and immunomodulatory function of mycolic acid cyclopropane stereochemistry by characterizing an M. tuberculosis cyclopropane–mycolic acid synthase 2 (cmaA2) null mutant (ΔcmaA2) that lacks trans-cyclopropanation of mycolic acids. Although titers of WT and ΔcmaA2 organisms were identical during mouse infection, ΔcmaA2 bacteria were hypervirulent while inducing larger granulomas than WT M. tuberculosis. The hypervirulence of the ΔcmaA2 strain depended on host TNF-α and IFN-γ. Loss of trans-cyclopropanation enhanced M. tuberculosis–induced macrophage inflammatory responses, a phenotype that was transferable with petroleum ether extractable lipids. Finally, purified TDM lacking trans-cyclopropane rings was 5-fold more potent in stimulating macrophages. These results establish cmaA2-dependent trans-cyclopropanation of TDM as a suppressor of M. tuberculosis–induced inflammation and virulence. In addition, cyclopropane stereochemistries on mycolic acids interact directly with host cells to both positively and negatively influence host innate immune activation. Citation Information: J Clin Invest. 2006;116(6):1668-1674. https://doi.org/10.1172/JCI22466. Citation Information: J Clin Invest. 2006;116(6):1675-1685. https://doi.org/10.1172/JCI26856. Failure to clear persistent viral infections results from the early loss of T cell activity. A pertinent question is whether the immune response is programmed to fail or if nonresponsive T cells can specifically be fixed to eliminate infection. Although evidence indicates that T cell expansion is permanently programmed during the initial priming events, the mechanisms that determine the acquisition of T cell function are less clear. Herein we show that in contrast to expansion, the functional programming of T cell effector and memory responses in vivo in mice is not hardwired during priming but is alterable and responsive to continuous instruction from the antigenic environment. As a direct consequence, dysfunctional T cells can be functionally reactivated during persistent infection even after an initial program of inactivation has been instituted. We also show that early therapeutic reductions in viral replication facilitate the preservation of antiviral CD4+ T cell activity, enabling the long-term control of viral replication. Thus, dysfunctional antiviral T cells can regain activity, providing a basis for future therapeutic strategies to treat persistent viral infections. Citation Information: J Clin Invest. 2006;116(6):1686-1695. https://doi.org/10.1172/JCI26991. Stearoyl-CoA desaturase–1 (SCD1) catalyzes the synthesis of monounsaturated fatty acids from saturated fatty acids. Mice with a targeted disruption of Scd1 gene locus are lean and display increased insulin sensitivity. To examine whether Scd1 activity is required for the development of diet-induced hepatic insulin resistance, we used a sequence-specific antisense oligodeoxynucleotide (ASO) to lower hepatic Scd1 expression in rats and mice with diet-induced insulin resistance. Treatment of rats with Scd1 ASO markedly decreased liver Scd1 expression (~80%) and total Scd activity (~50%) compared with that in rats treated with scrambled ASO (control). Insulin clamp studies revealed severe hepatic insulin resistance in high-fat–fed rats and mice that was completely reversed by 5 days of treatment with Scd1 ASO. The latter treatment decreased glucose production (by ~75%), gluconeogenesis, and glycogenolysis. Downregulation of Scd1 also led to increased Akt phosphorylation and marked decreases in the expression of glucose-6-phosphatase (Glc-6-Pase) and phosphoenolpyruvate carboxykinase (PEPCK). Thus, Scd1 is required for the onset of diet-induced hepatic insulin resistance. Citation Information: J Clin Invest. 2006;116(6):1696-1702. https://doi.org/10.1172/JCI27546. Functional and biochemical data have suggested a role for the cytochrome P450 arachidonate monooxygenases in the pathophysiology of hypertension, a leading cause of cardiovascular, cerebral, and renal morbidity and mortality. We show here that disruption of the murine cytochrome P450, family 4, subfamily a, polypeptide 10 (Cyp4a10) gene causes a type of hypertension that is, like most human hypertension, dietary salt sensitive. Cyp4a10–/– mice fed low-salt diets were normotensive but became hypertensive when fed normal or high-salt diets. Hypertensive Cyp4a10–/– mice had a dysfunctional kidney epithelial sodium channel and became normotensive when administered amiloride, a selective inhibitor of this sodium channel. These studies (a) establish a physiological role for the arachidonate monooxygenases in renal sodium reabsorption and blood pressure regulation, (b) demonstrate that a dysfunctional Cyp4a10 gene causes alterations in the gating activity of the kidney epithelial sodium channel, and (c) identify a conceptually novel approach for studies of the molecular basis of human hypertension. It is expected that these results could lead to new strategies for the early diagnosis and clinical management of this devastating disease. Citation Information: J Clin Invest. 2006;116(6):1703-1712. https://doi.org/10.1172/JCI27793. The balance between bioactivation and degradation of 1,25-dihydroxyvitamin D3 [1,25(OH)2D3] is critical for ensuring appropriate biological effects of vitamin D. Cytochrome P450, family 24–mediated (CYP24-mediated) 24-hydroxylation of 1,25(OH)2D3 is an important step in the catabolism of 1,25(OH)2D3. The enzyme is directly regulated by vitamin D receptor (VDR), and it is expressed mainly in the kidney, where VDR is also abundant. A recent report suggests that activation of steroid and xenobiotic receptor (SXR) also enhances the expression of CYP24, providing a new molecular mechanism of drug-induced osteomalacia. However, here we showed that activation of SXR did not induce CYP24 expression in vitro and in vivo, nor did it transactivate the CYP24 promoter. Instead, SXR inhibited VDR-mediated CYP24 promoter activity, and CYP24 expression was very low in tissues containing high levels of SXR, including the small intestine. Moreover, 1,25(OH)2D3-induced CYP24 expression was enhanced in mice lacking the SXR ortholog pregnane X receptor, and treatment of humans with the SXR agonist rifampicin had no effect on intestinal CYP24 expression, despite demonstration of marked CYP3A4 induction. Combined with our previous findings that CYP3A4, not CYP24, plays the dominant role in hydroxylation of 1,25(OH)2D3 in human liver and intestine, our results indicate that SXR has a dual role in mediating vitamin D catabolism and drug-induced osteomalacia. Citation Information: J Clin Invest. 2006;116(6):1713-1722. https://doi.org/10.1172/JCI25112. The autoimmune disease immune dysregulation, polyendocrinopathy, enteropathy, X-linked (IPEX) is caused by mutations in the forkhead box protein P3 (FOXP3) gene. In the mouse model of FOXP3 deficiency, the lack of CD4+CD25+ Tregs is responsible for lethal autoimmunity, indicating that FOXP3 is required for the differentiation of this Treg subset. We show that the number and phenotype of CD4+CD25+ T cells from IPEX patients are comparable to those of normal donors. CD4+CD25high T cells from IPEX patients who express FOXP3 protein suppressed the in vitro proliferation of effector T cells from normal donors, when activated by “weak” TCR stimuli. In contrast, the suppressive function of CD4+CD25high T cells from IPEX patients who do not express FOXP3 protein was profoundly impaired. Importantly, CD4+CD25high T cells from either FOXP3+ or FOXP3– IPEX patients showed altered suppression toward autologous effector T cells. Interestingly, IL-2 and IFN-γ production by PBMCs from IPEX patients was significantly decreased. These findings indicate that FOXP3 mutations in IPEX patients result in heterogeneous biological abnormalities, leading not necessarily to a lack of differentiation of CD4+CD25high Tregs but rather to a dysfunction in these cells and in effector T cells. Citation Information: J Clin Invest. 2006;116(6):1723-1730. https://doi.org/10.1172/JCI27775. Recurrent episodes of hypoglycemia impair sympathoadrenal counterregulatory responses (CRRs) to a subsequent episode of hypoglycemia. For individuals with type 1 diabetes, this markedly increases (by 25-fold) the risk of severe hypoglycemia and is a major limitation to optimal insulin therapy. The mechanisms through which this maladaptive response occurs remain unknown. The corticotrophin-releasing factor (CRF) family of neuropeptides and their receptors (CRFR1 and CRFR2) play a critical role in regulating the neuroendocrine stress response. Here we show in the Sprague-Dawley rat that direct in vivo application to the ventromedial hypothalamus (VMH), a key glucose-sensing region, of urocortin I (UCN I), an endogenous CRFR2 agonist, suppressed (~55–60%), whereas CRF, a predominantly CRFR1 agonist, amplified (~50–70%) CRR to hypoglycemia. UCN I was shown to directly alter the glucose sensitivity of VMH glucose-sensing neurons in whole-cell current clamp recordings in brain slices. Interestingly, the suppressive effect of UCN I–mediated CRFR2 activation persisted for at least 24 hours after in vivo VMH microinjection. Our data suggest that regulation of the CRR is largely determined by the interaction between CRFR2-mediated suppression and CRFR1-mediated activation in the VMH. Citation Information: J Clin Invest. 2006;116(6):1731-1737. https://doi.org/10.1172/JCI27657. In the vascular system, the receptor for the signaling molecule NO, guanylyl cyclase (GC), mediates smooth muscle relaxation and inhibition of platelet aggregation by increasing intracellular cyclic GMP (cGMP) concentration. The heterodimeric GC exists in 2 isoforms (α1-GC, α2-GC) with indistinguishable regulatory properties. Here, we used mice deficient in either α1- or α2-GC to dissect their biological functions. In platelets, α1-GC, the only isoform present, was responsible for NO-induced inhibition of aggregation. In aortic tissue, α1-GC, as the major isoform (94%), mediated vasodilation. Unexpectedly, α2-GC, representing only 6% of the total GC content in WT, also completely relaxed α1-deficient vessels albeit higher NO concentrations were needed. The functional impact of the low cGMP levels produced by α2-GC in vivo was underlined by pronounced blood pressure increases upon NO synthase inhibition. As a fractional amount of GC was sufficient to mediate vasorelaxation at higher NO concentrations, we conclude that the majority of NO-sensitive GC is not required for cGMP-forming activity but as NO receptor reserve to increase sensitivity toward the labile messenger NO in vivo. Citation Information: J Clin Invest. 2006;116(6):1738-1738. https://doi.org/10.1172/JCI27030C1.